This Sarinthip Siriwan movie page contains 42 records. Ithipon (Sahat Piempongsan) and Decha are two mafia leaders fighting for drugs control. They have a deal worth of 4M baht but Ithipon doesn’t go by himself and sends a bait. It was a trick as the bait is killed and Ithipon doesn't get the drug in exchange of the money. Sa (Apiradee Pawaputanon) and Jak (Sorapong Chatree) are loving each other but Jak is coming from a poor background (ธานะไม่เหมือนกัน) so Sa’s mother doesn't like him so much. Mot is a local police inspector always looking for proofs to arrest Ithipon and Decha. Jak's mother is played veteran actress Sarinthip Siriwan. It was one of her last movies. Protection fee (ค่าคลุม) needs to be paid by the mother, small restaurant owner, to the mafia led by Ithipon. As Jak refuses to pay, a fight erupts and one of the thugs is killed with his own knife while trying to stab Jak. Jak takes refuge in Decha's clan. His father is killed as a revenge by Ithipon's ruffians. A rich businessman fed up by Ithipon’s continuous requests asks Decha to get rid of him. Ithipon is shot at his home. Jak and Jon (Lak Apichat) are seen there despite Jak only injured Ithipon. A hitman being there is the one who killed Ithipon. Police inspector Sak is Sa’s promised fiance but she doesn’t love him. Sa's father is kidnapped. Following arguments with Jon and other thugs to release Sa's father, Jak gets injured (เพื่อนทรยศ) but succeeds to help the father. Jon promises to get revenge. Sa’s parents thank Jak for having released the father and wish him good luck. Jon finds Jak and tries to kill him. Following fierce fighting, Jon is finally the one to die. Jak wishes to take revenge over Ithipon. He shoots him and his remaining thugs. But police is now chasing Jak, Afraid he flees but finally surrenders when the police reminds him his duties over his mother and girlfriend Sa. 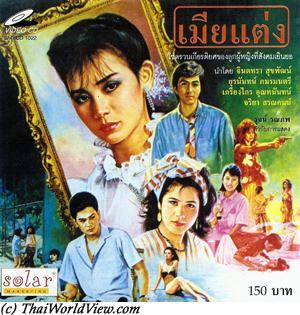 Thai movie ฆ่าปิดปาก released in year 1987 has a length of 1h23mn. The original film is certainly longer but may have been cut by Lepso to fit in VCD format. Yut is a young man selling his body to other men. He has no choice based on family survival necessity (ความจำเป็น). He is living with other men having the same job. Gik is also a poor lady student. She meets Pon that declares his love to her. Gik gets pregnant but Pon doesn't want to keep the baby. Yut meets Da (Naowarat Yooktanu), a lonely woman, who is rapidly fond of him. Da invites him to stay with his mother in her home and also pays for his studies. Da has already a baby. At the university, Yut meets another young lady called Mem. Mem is just a friend but Da is very jealeous and her love is excessive. Da is the mistress (เมียน้อย) of an older man, who is Mem's father! Yut decides to quit Da, who cannot bear it. She eats pill to die. She legates her money to him so that he can build his future through study and not through selling his body. Everybody has its own secrets and own problems. Hapiness doesn't come easily. Everybody want love and warmth (อบอุ่น). This movie highlights love misunderstandings and twisted loves between friends, children and parents. Two sisters are reunited together after the elder comes back from USA. A man is seduced by the younger sister's wit but he was the elder sister's lover in USA. How the sisters are going to manage this delicate situation? Princess (มจ.หญิง) Rattanawadee and her maid are going to London. Her brother's friend, Sadet, is working at the embassy. He was supposed to pick her at the airport but he fails to be on time. Rattanawadee is upset and very angry. She goes to complain at Sadet's home. She mistakes Sadet as the car driver. To avoid losing face, Sadet simulates being the car driver, called Lek, and propose them an Europe tour as a compensation for Sadet's lateness. They visit many countries in Europe including France (Versailles, Chateaux de la Loire...). Lek can speak many languages and is very cultured (รู้จักเยอะ) for a driver (คนขับรถ). Lek faces issues and jealousy from a hiso British Thai man called Wisan and willing to seduce Rattanawadee. The trip continues to Hamburg, Liechtenstein and then to the Swiss lakes. Love starts slowly to emerge. Jealousy also changes side as they meet a Thai tourist, Sasi, having high interest in Lek. Rattanawadee wishes to push Lek to marry Sasi as she is coming from a rich family but Lek will marry somebody for love and not for money. Sasi is rich (รวย) but has no manner (มารยาท). Finally Lek is uncovered as Prince Sadet working for the London embassy. After a short ire from Rattanawadee to have been abused, reciprocal love is declared. This movie has a typical scenario similar to many 1980s romantic movies where the two protagonists don't know their real status and identity. It looks like European countries discovery for Thai people. Whoever car driver or princess everybody expects love. 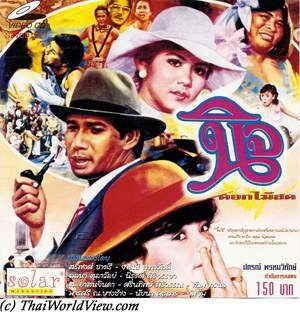 Thai movie นวลฉวี was released in year 1985 and lasts 1h56mn. It has received three Thai awards. Somsak Chaisongkram and two other men carry a dead body at nighttime. Utit (Apichat Halamjiak) is waiting for them and they take the body away by car. On the following day, Sompong Phonmitr finds a woman body floating in the river. It makes news headlines. The body is identified to be a nurse called Nuan Chawee (Sinjai Hongthai). This movie deals about the police enquiry to find who has killed the nurse. Utit (Apichat Halamjiak) is her husband, a doctor, and is claiming her dead body. Utit is interrogated by police. นาย Cheut and his wife, also a nurse, are suspected. Tuwit (Krailat Kriengkrai) is suspected as he used to love Nuan but as this love was not reciprocal, he married another lady. The movie has flashbacks between the investigation and Nuan’s story. Nuan and the doctor met each other in the hospital. Nuan fell in love with him and accepted to become his girlfriend. The doctor was going to be sent to Lampang. Nuan was waiting eagerly for the doctor to be back. Nuan presented her father (Somkuan Krajangsat) to doctor Utit as she hoped Utit would ask her hand for wedding. The love was not shared. Utit started to be fed up with Nuan (รำคาญ). Nuan was upset. Fed up by the doctor's lack of responsibility (ไม่ยอมรับผิดชอบ), she threatened to shoot him if he didn't marry. Under pressure, doctor Utit accepted. But the doctor’s mother (Sarinthip Siriwan) refused to accept Nuan. Nuan and her father complained to the hospital’s director. It caused Utit to be very upset and he hit Nuan. Nuan saw doctor Utit with another girl (Wiyada Umarin). Two brothers were involved in the murder. As Nuan learnt Utit had also married Umarin 6 days after her, she threatened the doctor to go to justice. Utit was fed up with Nuan as she could really mess up his future and position in the society. Wiyada saw her a competitor. So everything was in place to get rid of Nuan and to kill her with the help of the local undertaker (สัปเหร่อ) Somsak and the two brothers as intermediates. Wiyada and doctor Utit finally recognize their culpability. It is based on a real story, which happened in year 1959. Leu (Sorapong Chatree) is a poor Tuk Tuk (สามล้อ) driver and has difficulties to find money to pay his son Tawan school fees. The headmaster (Sarinthip Siriwan) has limited understanding. One day fightings erupt with ruffians asking for protection fee to a Tuk Tuk driver. Leu and his friends (Panna Rittikrai, Note Chernyim) help. Leu hits violently Pipop Pupinyo. Yot (Manop Aussawathep) is head of ruffians. Kowit is a policeman but he cannot help that much. Wan (Thitima Sangkapitak) is owning a street restaurant, where Tuk Tuk drivers always eat. Tuk Tuk needs to pay a parking fee despite it is a public road. Leu is aggressed again while driving his Tuk Tuk so he is late at school to pick up his son. Teacher Panit (Suriwan Suriyong) sends his son back home. The teacher Panit complains on Leu not taking care enough of his son. Fighting erupts with ruffians looking for troubles with the teacher Panit but she has good fighting skills also. Panit is in fact the daughter of Yot. Ruffians fight again with the Tuk Tuk drivers as they refuse to pay extortion fee. They all end up in police station. Thanks to bad influence (อิทธิพล) of gangster Sia Boon Mak, ruffians are released first. The owner of Tuk Tuk cars pay finally for the release fee as the drivers are just renting the cars so they have no money. Leu is very late picking up his son so he meets the teacher again at his home. Sia Boon Mak (นักเลงใหญ่) forces Yot to work with him as he threatens his daughter. Brakes are damaged on Leu's Tuk Tuk as a warning. Tawan's mother, former teacher, died many years ago in a bus accident. Both Leu and Yot ended their studies at ป.4 level. Panit would like her father Yot to stop his dirty ways to do business (วิธีการสกปรก) by exploiting other poor people. Yot argues he had no choice as the society doesn’t give a lot of opportunity to succeed for people ending their studies at low level (ป.4). Following his daughter pressure and wishing to change his life, he agrees to stop. Meanwhile Sia Boon Mak’s ruffians cause Leu's Tuk Tuk to have an accident and his son dies. Leu promises to revenge and refuses to see Panit anymore. Panit proves him that her father is not involved in his son’s death. Yot is now on Leu's side. Leu fails to kill Sia Boon Mak but injures him. As revenge Yot is shot and killed. Wan is kidnapped and killed by Sia Boon Mak. It is too much and Leu assisted by Panit and an army of Tuk Tuk drivers storm Sia Boon Mak’s den. Police led by Kowit finally arrives. Leu doesn't perform self justice and lets police to arrest Sia Boon Mak. Justice will be performed but Leu has to lose his son for this justice to happen… Movie director is มนู วรรณายก. This movie was released in VHS format but never in VCD or DVD formats. It is about "ISAN" (อีสาน), area in the Northeast of Thailand. This is the poorest area in Thailand. This movie relates the life of Koon, a small boy living in a village. It is based on the book "A Child of the Northeast" ("LUK ISAN" - ลูกอีสาน) written by Kampoon Boontawee. It has won Thailand's first SEAW ite Award in 1979. The film is shot in Lao language. It shows the harsh life of Isan farmers. Some villagers are leaving the area due to drought. Remaining villagers have to quest for water every day. Raining is not coming so a cat ceremony is organized. Water is thrown to an encaged cat in order that his shouts make the rain deity to take pity on him. Monks are the advisors of the communauty and children go to schools located inside temples. Village shops are held by Vietnamese and Chinese people who argue together to sell goods to local people. Koon's family is setting up a caravan to go to the Mun river and stock fishes for a few months. Koon learns hunting skills from his father. Koon's cousin has to marry swiftly as her parents found she spent a whole night with one young man. Molam singers visit the village bringing joy and news from the outside world. An old woman is lamenting on her future as her husband is dead and her daughter only wishes to quit the village and its harsh life. This movie is winner of several international awards and was selected for the 1983 Berlin Film Festival. This movie is part of the first 25 films heritage list announced on October 4 2011, which is Thai Movies Conservation Day. 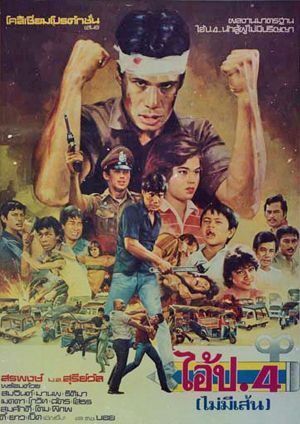 Thai movie สายใจ was released in year 1981. It lasts 1h45mn. Yae Suk (Naowarat Yooktanun) and Den (Pisarn Akraseranee) have a car accident. They find an arrangement for the damages (ค่าเสียหาย). Her parents are Sarinthip Siriwan (คุณหญิง) and Sawin Sawangrat. Da (Nanthida Kaewbuasai) is her sister. Yae Suk is selling old items from her grandfather to allow the family to survive (หมดตัวแล้ว). But the parents either gamble the money or bet on horses. The father meet Somsak Chaisongkram and Saksit (Porjed Kaenpetch) while playing cards. The father invites them for lunch as he has the idea to marry his daughters in order to get money from the dowry (ค่าสินสมรส). A family gathering for all parties including Ampha Pusit happens to know each other. Da doesn't like Saksit as she believes he is just a gambler. He loses on purpose. Saksit pretends he can buy anything (ซื้อความนับถือความรักไม่ได้). Pho Lieng is also interested by Da and even tries to abuse her. Saksit helps her on time. They all go for a hike in the mountain but accidents occur. Finally Saksit and Da sympathize. Pho Lieng sends men to get rid of them. They have to spend the night in the forest but finally defeat the ruffians. As his daughters spent night outside home, the father claims his family name is tarnished (ขายหน้า). Da refuses to get sold (ถูกขาย). One old family friend mentions that the family name is already tarnished since a long time as the father and mother are strong gamblers. It shouldn't be the daughters' duty to pay for their gambling vice. Misunderstanding happens between Da and Saksit. Den helps to solve the issue. They finally get reunited also. 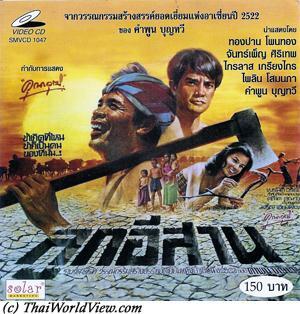 Thai movie เครือฟ้า (สาวเครือฟ้า) was released in year 1980. It is available under DVD format (1h49mn) and VCD format (2h01mn) released by former company Solar. During World War 2, Hoi is a military officer (นายทหาร) in Chiang Mai back from overseas. Hoi (ลูกผู้ดี / ลูกพญา) is coming from a high society family (Sarinthip Siriwan). Hoi (Nirut Sirijanya) meets a young Northern lady called Kreua Fa (Supansa Nuengpirom) at a traditional dance event. Chiang Mai is famous for the beauty of its ladies (เมืองคนงาม). Kreua Fa's father raised elephants. Local North people speak local northern dialect in the movie. Kreua Fa makes Hoi discover elephants’ life in the forest. A local old notable wishes to marry Kreua Fa. The notable involved in drugs trafficking wishes to get rid of Hoi. A plan is set up to have Hoi having a deadly accident in the forest with an elephant but Kreua Fa helps him on time. Romance starts between them. They finally marry following Northern traditions. As Thailand has declared war to Germany, Hoi needs to go back to Bangkok and then to fight in Europe. His plane is hit and Hoi lost his memory. Three years have passed. Champa has been taking care of him during his long recovery. Hoi's parents settle the wedding with this rich heiress (Wiyada Umarin). Meanwhile Kreua Fa has delivered a child. The evil notable kidnaps Kreua Fa's baby to force her to become his wife. Kreua Fa's friends use elephants to release her and the notable is arrested for drug trafficking. One day Hoi is invited to Chiang Mai to demonstrate Thai airplanes. Kreua Fa hearing the plane believes Hoi comes back for her. Hoi has the feeling he went to Chiang Mai before losing his memory (ความทรองจำ). The new wife is aware of Kreua Fa but hides the truth to Hoi. Officer Pla explains the truth to Kreua Fa that Hoi lost memory as his plane was hit during the war. Kreua Fa needs to wait. Kreua Fa tries to get suicide. Finally aware of a ball given by high society, she decides to find Hoi. During the ball, arguments arise between Kreua Fa and Champa but Hoi cannot remember Kreua Fa. Kreua Fa is so disappointed so she decides to kill herself. Hoi finally recovers his memory. While rushing to find Kreua Fa, he just arrives on time to have her dying in his arms. She entrusts her child to Hoi. 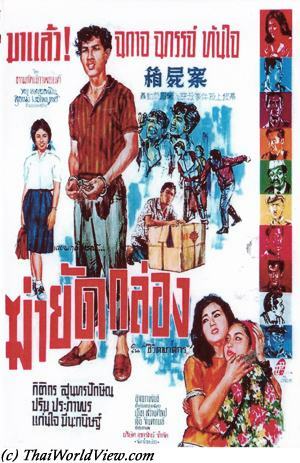 This movie has been released in theaters before in year 1953 (Chalit Susewee and Wilaiwan Watthanaphanit) and 1965 (Mitr Chaibancha and Pissamai Wilaisak). Two young new married people from Thai high society receive strong pressure from their family. The husband's mother try to persuade her son to divorce. The wife's younger sister wants to have a pleasant life without working. Will their wedding be strong enough to resist? This movie is the second part of "Baan Sai Thong". In North of Thailand, a mother has got two daughters, Pim and Kaew. Pim has been a prostitute and has now a new boyfriend. Kaew is in love with a poor peasant. The mother pushes Kaew to go to Bangkok during one year to be a prostitute in order to buy her a house and pay her debts. Pim tries to hinder her mother but has to go to Bangkok. In Bangkok, she discovers that her boyfriend is already married. She also discovers that she is sick with leprosy. Meanwhile Kaew follows her mother's order and goes to Bangkok to be come a prostitute. Pim's boyfriend left her and now takes care about Kaew. Knowing this, the boyfriend's wife throws acid on Kaew's face. Nobody becomes happy. This movie shows the good view (girls going back to their home with nice clothes, gifts to family, money to buy house) and the sad view (girls beaten by pimps, forced to have many customers and getting diseases). It also emphasizes the cruel dilemma, i.e. stays poor or loses dignity but becomes rich. The movie is built same a theatrical "Likay" (ลิเก) with traditional music. It portrays the Thai culture and way of life though a romance. Peasant Riem loves Kwan but the love is not reprocical. He loves singing Likay. Traditional peasant way of life, watching over buffalo, rice planting, getting fish from rice fields, ceremonies where young men invite girls they like to dance, Songkran ceremony with small pagoda made of sand are gracefully shown. They finally love each other with a promise in front of the local deities tree. But Riem family refuses this love story. Choi, local gangster, injures Kwan with his sword making a scar. This scar is the symbol of their love that nothing can break. Riem's father wants to sell her to the local gangster Choi. Riem's father is local "Kamnan" (กำนัน) but has many debts with Choi as he likes to gamble and drink alcohol. Riem is enslaved with chains. Kwan infliges a scar to Choi also but when he tries to free Riem, it is too late. Her father and Choi have brought her to Bangkok. There she is integrated to a rich Bangkokian family as she has the same face as their deceased daughter. A young man called Somchai is courting her. Riem discovers high society Bangkokian life with balls and European orchestra. The contrast is flagrant with village life and Kwan playing flute on his buffalo. Kwan arrives in Bangkok and searches for Riem. He cannot find her. He chases Choi to know where he sent Riem but during a sword fight, Choi is killed. Three years have passed. Knowing that her mother is sick, Riem goes back to visit her. Kwan has chance to meet Riem but Kwan also understands that she forgot him. He asks again for the support of the local deities. Riem misses her home and Kwan. She finally comes back as her mother is dying. In the past, her mother marries her husband for money in order to be secure but was never happy with him. So she advises her daughter to listen to her heart as love is more important than money. Riem promises to tell Kwan her decision in front of the local deities tree. On the same day, seeing that his father is getting older and older, Kwan promises him to honor his wish to see his son in yellow robes (ชายผ้าเหลือง) as a monk. Learning that Riem is forced to go back to Bangkok, he decides to help her but faces opposition from Riem's family and Somchai. Finally Somchai shot Kwan fatally and he drowns in front the local deities tree. Riem stabs herself and drowns with her beloved Kwan. Kwan's father will never see his son in yellow robes (ชายผ้าเหลือง) as a monk. 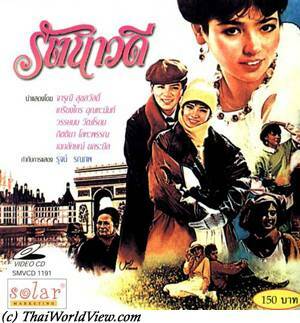 Historically, Cherd Songsri's movie is a classic tale of star-crossed lovers and was one of the first Thai films to be a success internationally due to the precise representation of rural Thailand. It got Top award at Festival des 3 Continents in Nantes, France in 1981. 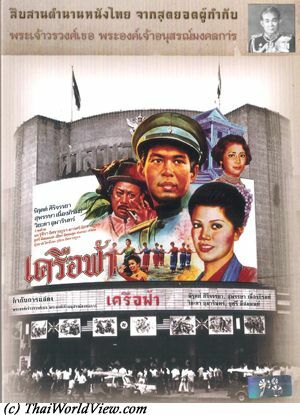 This movie is part of the first 25 films heritage list announced on October 4 2011, which is Thai Movies Conservation Day. 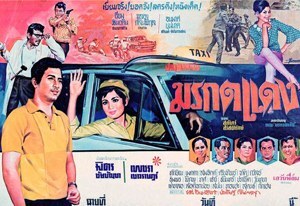 Thai movie จุ๊บแจง was released in year 1970. Main actor is Sombat Methanee and main actress is Aranya Namwong. The movie is in 16mm format and so in mute state as such format requires dubbing. The film is incomplete as only 1h31mn remains to be seen. No summary is available. The movie features four songs but they are lost. Aranya Namwong is Jub Jaeng. Her parents are played by Somkuan Krajangsat as father and Wilaiwan Watthanaphanit as mother. Her mother seems upset. Sombat meets Jub Jaeng's mother indulging in alcohol. Marasee, a rich old lady, orders Adinan Singhiran to kidnap Jub Jaeng. While discussing inside the house, three thugs storm it and kidnap Jub Jaeng. The father and mother get hit by the thugs. Somjit Sapsamruey is Sombat's mother. Prachuap Ruekyamdee releases Jub Jaeng but it is a coup monté. It seems that Jub Jaeng is coming from a rich family. Khomapat Attaya and her mother Sarinthip Siriwan are having arguments with Jub Jaeng. Sukon Koewliam and Chosri Misommon are playing comic roles a domestic helpers. Sombat tries to seduce Jub Jaeng. They finally become lovers. Khomapat and her mother denigrate Jub Jaeng towards Sombat. Khomapat pushes Aranya in the stairs. She ends up at hospital. Wilaiwan and Somkuan finally find Jub Jaeng. They finally get reunited thanks to Sompong Phonmitr. This movie features sequence shot in famous Daimaru former shopping mall. Prachuap has a leg injury and is visited by twin ladies (real singers อารยา ปาริชาติ ฉายาลักษณ์). Finally the parents let Jub Jaeng go with Sombat. Khomapat and her mum are upset about the gifts bought by Sombat to Jub Jaeng. Sombat tries to end the dispute with Khomapat but it ends up badly. While walking on the beach, he gets stabbed by ruffians. Khomapat gets also aggressed by ruffians on the beach. Khomapat tries to hit Jub Jaeng again but she fights back and finally decides to quit this crazy house. Prachuap and Sombat finally understand Khomapat’s bad games. Sombat rushes after Jub Jaeng and they finally reconcile. 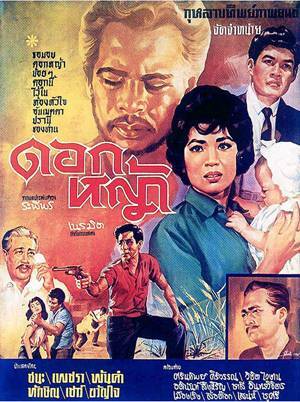 Thai movie กายทิพย์ was released in year 1970. The movie lasts 2h30mn but only 1h00 is left to be seen. Jaomanat (Sarinthip Siriwan) is Atibadi’s domestic helper. Jaomanat has two sons Phayoton (Sombat Methanee) and Pontet (Prachuap Ruekyamdee), playing a gay character (กะเทย). Atibadi (Chana Sriubon) has two daughters Romadee (Aranya Namwong) and Deuan Rung (Sopha Sataporn). Atibadi’s wife (Wilaiwan Watthanaphanit), called Nimnuan, is dead already but her soul (วิญญาณ) has possessed Jaomanat. Three house spirits (ศาลพระภูมิเจ้าที่) are also involved. Two of them are played by Sukon Koewliam and Sithao Petcharoen. Krai Kanchit, a hairdresser, gets warned by Phayoton not to disturb Jaomanat anymore. Fighting in slum(สลัม) happens between Phayoton and Krai. Krai is defeated. Sawin Sawangrat comes later with more men to beat Phayoton but the three house spirits help him. สุมาลี ทองหล่อ, mother of Khomapat Attaya, wishes to grab Atibadi. Finally Atibadi takes Sumalee as his new wife. During the wedding party, Khomapat comes with Ruj Ronnapop but Khomapat has more interest in Phayoton. Sompong Phonmitr is playing a หมอทำเสน่ห์. Sumalee and Sawin visit the magician at the same time but they get teased again by the spirits. Krai comes at that time and meets Sumalee. They become lovers. Sumalee and Atibadi spend their honeymoon in Pattaya. Deuan Rung likes Phayoton but this one manages to have his brother Pontet taking care of her so that he can be with Romadee. Meanwhile Krai has seduced also Khomapat so causing Sumalee's ire. She sends Pan Borapet and Sawin to teach (สังสอน) Krai but they kill him. Upset, she also kills Pan Borapet and Sawin. Sumalee is feeling sad (น้อยใจ). Op Boonthit identifies that Nimnuan’s sould (วิญญาณ) is inside Jaomanat. A proper ceremony needs to be done. Sumalee wishes to interrupt it. Monks need to be brought. While the soul is about to exit, Sumalee prevents the holy water to be poured. She is struck by a lighting and dies. Ruj is ravaged. Finally Jaomanat can fully recover. 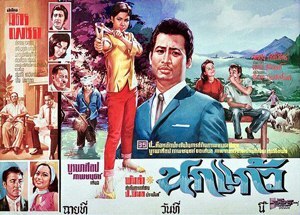 มรกตแดง or the “Red Emerald” is a Thai movie released in year 1968. It is an almost lost movie as only 10 seconds are left. The poster and movie script summary are still available. Due to issues with ruffians as they are coming from a rich lineage, Petchara Chaowarat and her mum have to flee. Petchara has to wear boy clothes since childhood to deceive ruffians. Being an adult, she then drives a taxi to earn a living and support her mother. Mitr Chaibancha meets Petchara two times, once when she is a beautiful lady and once when she is a taxi driver. Mitr cannot find the beautiful lady anymore as Petchara’s mum forbids her to wear feminine clothes again. Mitr is looking for a lady with a red emerald, who is Petchara's mother. Mitr uses Petchara as the taxi driver to find the lady. But ruffians kidnap the mum to get the red emerald. Finally Mitr, Petchara and her real father contribute to release the lady. The movie ends happily. In this movie, Petchara Chaowarat has short hair. It looks like in this 1968 period, she changed her look and her short hair style can also be seen in other 1967/1968 movies such as ปูจ๋า. 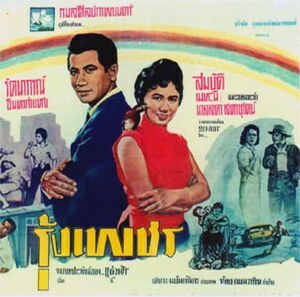 Thai movie แสนพยศ was released in year 1968 and features key actors Mitr Chaibancha and Aranya Namwong. Other actors / actresses include Daonoi Duangjai, Prachuap Ruekyamdee, Naowarat Watchara, Preeya Roongrueng, Lor Tok, Sukon Koewliam, Sompong Phonmitr and หม่อมชั้น (famous Thai actress from royal lineage and often playing low roles such as domestic helpers…). It was shot at same time as movie Iten – อีแตน (35mm format and year 1968). The movie was lost in Thailand but finally a partial reel was found in year 2013 thanks to a teacher and collector of old items in Songkhla area. A 5mn30s sequence is still available. It is in fact the first movie (16mm format) played by Aranya Namwong after she became Miss Thailand. A group of ladies including Naowarat Watchara are talking together and seem to prepare a plan. Not sure if it is targeted against Aranya? In another sequence Aranya is locked. A mamasan wants to force Aranya to go with a rich customer but she gets slapped. Even ruffians fail to coerce her. Last sequence is showing Mitr and Aranya talking together under a tree. Aranya Namwong played in movie ลมหนาว but only in a short sequence where she sang a song. Later on, she played again with Mitr in อีแตน which is often mistaken as Aranya’s first movie. In Fact Iten (อีแตน) is her movie in 35mm format and แสนพยศ is her first movie in 16mm format! The two movies were probably shot at the same time. The movie poster announces that Mitr meets miss Thailand! A TV serie (ละคร) was done in year 2000. 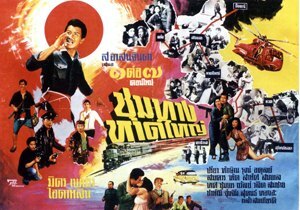 Lom Nao - ลมหนาว (1966) is a lost movie. Only the poster and the movie song are left. Luckily there are still 13 minutes 'behind the scene' sequences in black and white to be seen. Movie director is Phan Kam. It is a movie in which many famous Thai actors and actresses played, i.e. Mitr Chaibancha, Petchara Chaowarat, Aranya Namwong, Sor Asanajinda, Taksin Jampol, Adul Dulyarat, Dokdin Kanyaman, Lor Tok, Preeya Roongrueng, Kingdao Daranee. It was Aranya Namwong’s first movie. She was just awarded during a recent Miss Thailand beauty contest. An orchestra was used for the movie theme sung by Aranya Namwong. 16mm movies used a single camera for the shooting. Various sequences can be seen, i.e. Charin and Lor Tok helping Mitr Chaibancha and Taksin Jampol engaged in a fight with ruffians. Another sequence is involving Petchara Chaowarat wearing a beautiful dress and featuring the movie theme song. It is the dress that can be seen on the movie poster. A sequence of Charin and Aranya Namwong can be seen. Those sequences were recorded in 35mm format so that the original song was together with the movie reel. Other sequences are recorded in 16mm format so requesting a live dubbing. Other sequences feature Mitr Chaibancha and Petchara Chaowarat together on a small boat. A funny sequence with Dokdin Kanyaman singing can also be seen. Worth to notice that in real life Mitr Chaibancha and Kingdao Daranee were married. Petchara Chaowarat and Charin Nantanakorn married later in year 1975. นกแก้ว is a 1969 Thai movie in 16mm format with no sound. It was directed by Phan Kam, who directed more than 60 movies in his whole career. Only 1h10mn is left. Only the first and last film reels are left. So it is difficult to understand accurately the whole story. Prachuap Ruekyamdee is Petchara’s close friend. In a village on the countryside, Petchara Chaowarat catches Lor Tok trying to get fishes in their field. Sukon Koewliam is also having another comic role in the village. A grandfather in a wheel chair is talking to his son in Bangkok. As he is going old, he needs to prepare his succession. Petchara is his hidden granddaughter with another woman. The rich family siblings doesn't want her to receive anything. Anucha Rattanamarn is fiance with Kaenjai Meenakanit. They prepare a plan to disinherit Petchara. Mitr Chaibancha, the grandson, is offering flowers to the grandfather. There is a carnival in the village. Adul Dulyarat, a mysterious rich man, meets with Petchara. Petchara and Kaenchai meet also. She gives her a letter. What is inside the letter? Certainly a letter in which Petchara shall reject her rights to the heritage. Later on, Adul wants Petchara to sign a letter but she refuses so he slaps her. Adul threatens her mother to force Petchara to sign the letter. Meanwhile Mitr and Ruekyamdee enter secretly in the house where Petchara is held prisoner in order to help her. Shootings happen with ruffians but Thai police arrive on time to catch Adul. There is an important meeting to open heritage documents at the same time. Petchara arrives on time before the final signature! The grandfather was kept in the dark regarding Petchara by his own family but they all got arrested by police for forgery. 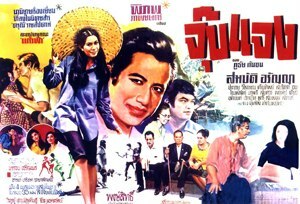 Many movies names with Mitr and Petchara started with นก (bird) such as นกยูง (1969), นกแก้ว (1969), นกขมิ้น (1965) or นกน้อย (1964). 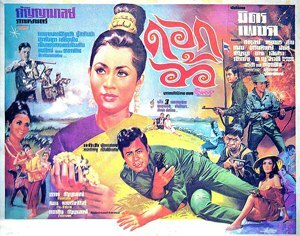 Thai movie Chum Hat Jai (ชุมทางหาดใหญ่), directed by Sor Asanajinda in year 1966, is lost in Thailand but luckily a sequence of 1h08mn (three last reels) is still left. It was stored in a museum of a Thai temple in the north of Thailand. Only incomplete summary is available. This movie is a mix of comedy, romance and action. This movie was shot in Songkhla area so showing how this southern city was fifty years ago. As the movie is in 16mm format, it requires live dubbing so the remaining extract is in mute state making it more difficult to understand. Sena Prachan (Mitr Chaibancha) is an army officer. Jing Gang (Petchara Chaowarat) is a fearsome young lady (ไม่กลัวใคร). Sena Prachan is pretending being crazy (อาคารเป็นบ้า) in order to spy Chao Likim's (Tawan Siriwat) activities. Ai Darling (foreign actress) is Chao Likim's daughter. Sena's kisses are able to calm down Ai Darling and also Jing Gang while he is investigating on ruffians. 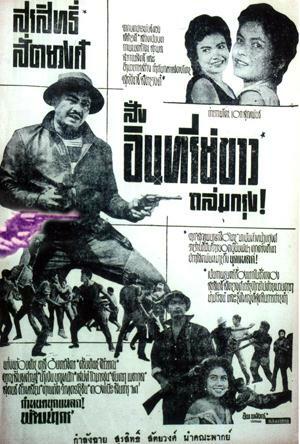 Many other characters are present such as Chanee Yotchai as ruffian, Ruj Ronnapop (Mayong), Sukon Koewliam, Choomporn Theppitak, Taksin Jampol (Bo Bang Rajan), Preeya Roongrueng, Adul Dulyarat (captain). Ai Darling and Jing gang fight over Sena Prachan. Tat (Tat Ekathat) is head of police. Mayong is shot facing seven ruffians. Chao Likim hits his own daughter considered as a traitor (ลูกสาวทรยศ). Sena Prachan helps but is also finally captured. Jing Gang’s parents are Somkuan (Somkuan Krajangsat) and Thanyong (Sarinthip Siriwan). 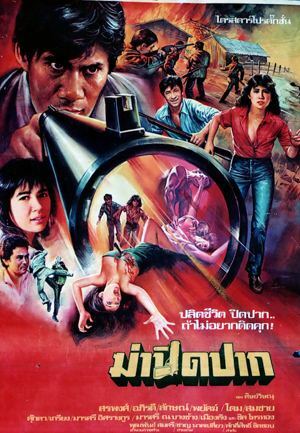 Thanyong gets shot while helping Bo Bang Rajan, who is also an undercover military officer. Sor Asanajinda is also playing. A train is chased by a car and an helicopter through Songkhla region landscape. Somkuan, a repent (ผู้ร้ายที่จะกลับใจ), is forced by Chao Likim to be part of a prisoner exchange deal (แลกตัว) but he is carrying a bomb. The movie ends up with multiple shootings between ruffians and the heroes. Somkuan gets shot by Chao Likim but this latter also gets shot by Jing Gang and Sena Prachan. 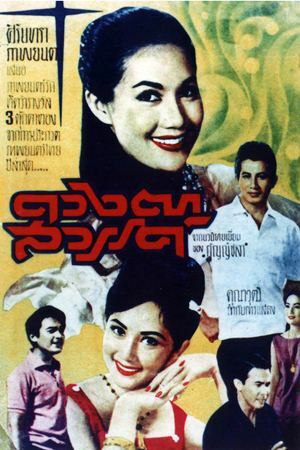 Thai movie อ้ายค่อม was released in year 1966. Main actors and actresses are Luechai Natnat, Pawana Chanajit, Taksin Jampol, Kaenjai Meenakanit, Sukon Koewliam, Lor Tok, Sarinthip Siriwan, Preuhat Boonlong, เมืองเริง, มานี, เปลวใจ, วิน, วิชิต, Prim Praphaporn, Chosri Misommon, Mom Chan Phuangwan, Tawan Siriwat. Movie director is เกรียงศักดิ์ สุริยา. The movie is lost in Thailand but a sequence in 16mm format is left to be seen. It features the movie title sequence and only lasts one minute. The image shows lotus in front of a village. Colors are lost. 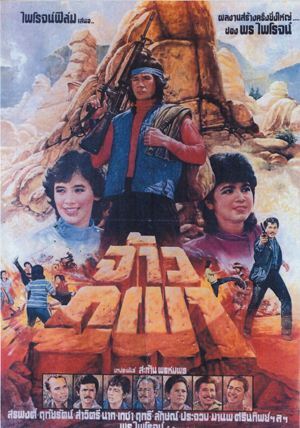 The movie was released again as a remake in year 1980 with Sorapong Chatree and Jarunee Suksawat. Thai movie ฆ่ายัดกล่อง is based on a case, which is a real story and occurred in year 1965. Regarding the assassin, it was จรินทร์ สิทธิธรรม ฉายา “กระทิงแดง ศิษย์พระกาฬ”. The victim is teen กิมบั๊ก แซ่อึ้ง being 15 years old. He killed this teen and put the body in a box (ส่งศพมาทางรถไฟ) and throws it in a train going to Chiang Mai. As he was cooperative during investigation, he didn't get death sentence but life imprisonment. Movie director is อัจฉราพันธ์. Actors also include เมืองเริง ปัทมินทร์ and กิติกร สุนทรปักษิ. The movie lasts 1h46mn and is a 16mm film in mute format. The 16mm film has still a colorful image but it was never released commercially in Thailand so it is still in mute mode as 16mm films require live dubbing. The movie is probably incomplete as 1960s movies were often more than two hours long. The movie seems to diverge compared to the real police case. Two schoolmates including Kitikorn (กิติกร สุนทรปักษิ) are fighting together because of a female student. Sarinthip Siriwan is Kitikorn’s mother. The husband is a drunkard. The son Kitikorn protects his mother. The mother and stepfather finally stab each other. Kitikorn goes to Bangkok. He meets a man and his daughter (Prim Praphaporn) as soup sellers. Prim appreciates Kitikorn. Kitikorn takes refuge in an uncle's home in Bangkok. Sukon Koewliam plays a policeman role. The two youngsters, Prim and Kitikorn, leave to stay together. Kaenjai Meenakanit meets Kitikorn and convinces him to go to hotel room. It is a trick as in the hotel room, a photographer takes a picture of them. He gets threatened by Krai Kanchit. Prim goes to Krai's house and gets some money. The young man is threatened again and understands he has been fooled by Kaenchai. A movie reel must be missing as Kitikorn is then seen at hospital with Prim, going to give birth. His child unfortunately dies. Kitikorn goes to see Kaenchai again and blames her. As she wants to get rid of him by giving him money, he hits her. He needs to buy medicine for Prim but he has no money. Kitikorn steals some goods at the pharmacy but a man is killed during the fighting. Police is involved. The police leader enquiries over Krai. Police visits Prim's home but Kitikorn flees before. Police chases him in the countryside. He hides in a Buddha cave. A monk finds him. Police asks him to surrender. Prim and his uncle ask him also. The monk convinces him to surrender. 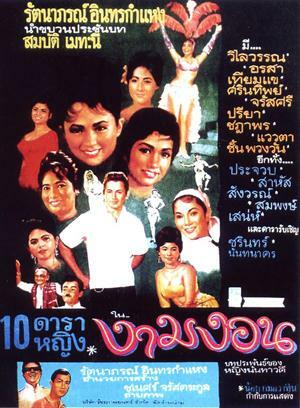 Thai movie ดวงตาสวรรค์ was released in year 1964. Director is Wichit Khunawut. Main actor is Sombat Methanee and main actresses are Pissamai Wilaisak and Sopha Sataporn. Other actors / actresses include Adul Dulyarat, Prachuap Ruekyamdee, Preuhat Boonlong, เชาว์ , Sarinthip Siriwan. Sukon Koewliam and Daonoi Duangjai are playing as domestic helpers roles. Pissamai Wilaisak got a Thai cinema award (ตุ๊กตาทอง) for this movie. Wichit Awut also got a Thai cinema award for his directing skills for this movie. This is the first movie played by Sopha Sataporn. This movie is lost in Thailand and only a sequence of 23 minutes is left to be seen. Pissamai is coming from countryside but changed her name ("อีแพน") as she wants to increase her status in Bangkok society ( สาวสังคม / นักเที่ยว). She is now a cinema star (ดารา). She likes Rawin (Sombat Methanee) but he is already engaged with Sopha. Teun (Prachuap Ruekyamdee) is disappointed that Pissamai finally married with Chai (Adul), a teacher training painting arts. Pissamai marries with Adul to have opportunity to be closer to Rawin. Teun and Pissamai know each other since they were youngsters in the countryside. They were lovers before. Before the wedding, Rawin congratulates Pissamai but gets slapped as she tells him she doesn’t love Chai. Teun keeps drinking alcohol as he is disappointed. Pissamai's father visits her knowing she is now a star and married to a rich man. Pissamai is very bad (ร้าย) as she chases away her father and younger brother by trying to give them money. The left sequence ends here. Another recent version was shot in 1981 and features Sorapong Chatree and Pisarn Akraseranee. Thai TV series were also released. 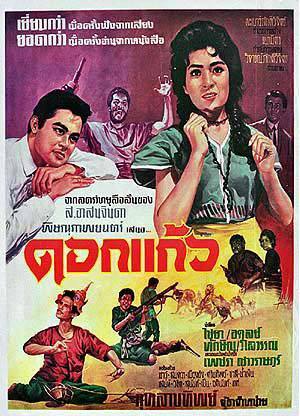 ดอกหญ้า is a Thai movie released in year 1962 with Petchara Chaowarat as main actress and Chana Sriubon as main actor. The movie is lost in Thailand and only a 47 seconds sequence remains to be seen. During this short sequence Petchara is discussing with a middle age man. A nanny is then carrying a baby. The sequence still has a colorful image. The partial story is a below. Siriporn (Petchara Chaowarat) is a 16 years old orphan girl living with her grandfather in Chumporn. The grandfather is a gardener. Siriporn sells the garden fruits on the local market. She meets Ms Nanthaka who sends her to study in Bangkok. Reuang Sak (Chana Sriubon) is neighbour of Ms Nanthaka. Ms Nanthaka wishes Reuang Sak to marry her daughter but Reuang Sak loves Siriporn so they get lovers before he is sent to study overseas. Ms Nanthaka’s husband is a nice guy but his wife is selfish. Siriporn gets a baby with Reuang Sak. The man with the gun on the poster is the man who raised Siriporn since her youth. 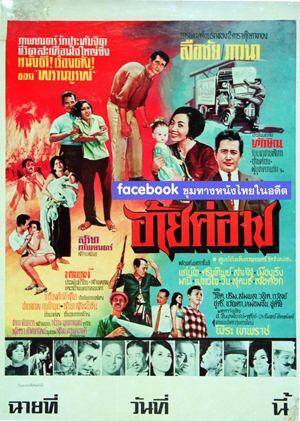 Thai movie ดอกแก้ว was released in year 1962. It features Petchara Chaowarat as main actress and Adul Dulyarat / Chaiya Suriyun as main actors. The movie was produced by กุหลาบทิพย์ ภาพยนตร์ (Celestial Rose Movies). The movie is lost in Thailand but a sequence of twelve minutes is left to be seen. Other actors and actresses are Chao Klaewklong , วิชิต ไวงาน, เมืองเริง ปัทมินทร์. A man (Somkuan Krajangsat) is found dead. He has been shot by a ruffian. Adinan tries to protect him but he is also shot. It looks like there is a testament left behind. Next sequence shows Wilaiwan Watthanaphanit and Adinan Singhiran, who is injured. Wilaiwan is holding a baby. Adinan dies so Wilaiwan flees with the baby but meets robbers. Shootings happens with the Police. The robbers’ leader protects Wilaiwan. Next sequence shows Taksin Jampol and Petchara as mountain people. Maybe Petchara was the baby seen in the earlier part of the movie. While going to the city, Taksin and Petchara give a hand to Adul being aggressed by ruffians. Next sequence shows Chaiya and Sarinthip Siriwan. It looks like Adul and Chaiya are brothers. Petchara is now living in a nice house and wears beautiful clothes. Taksin is upset that Chaiya and Petchara are friends. Chaiya helps Petchara aggressed while taking care of a baby. Petchara uses a gun to protect Taksin also being threatened by a ruffian. 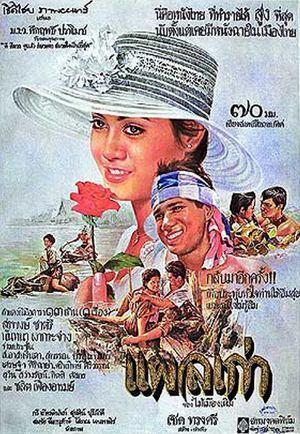 A remake of ดอกแก้ว was released in year 1981 and featured Sorapong Chatree. 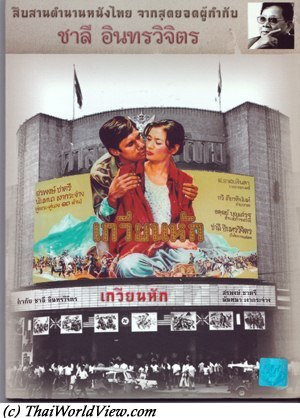 At that time Dok Kaew was a famous movie and was projected as same time บันทึกรักพิมพ์ฉวี. Having two famous actors such as Mitr and Chaiya helped to boost Petchara’s career. 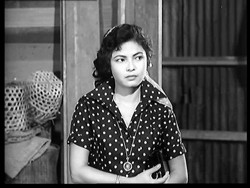 This movie รุ้งเพชร was shot in 1961. Main actors are Sombat Methanee and Ratanaporn Intarakamhaeng. It was Sombat Methanee’s first movie (พระเอกใหม่). It was first opportunity for Sombat as a handsome young and muscular leading actor. Sombat was 4 to 5 years younger than the leading actress. This 16mm version is partially lost and only 48 minutes are still left to be seen. The film has no sound as all 16mm movies were dubbed. Rung’s best close friend is a bird "NOK IENG" (นกเอี้ยง) sitting on her shoulder. As often in old Thai movies, bad female characters are depicted as smoking girls. 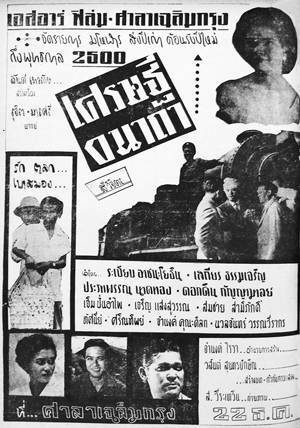 Another version, a 35mm film, was shot in 1980 with Sorapong Chatree, Sor Asanajinda, Settha Sirachaya as actors and Nanthida Kaewbuasai, Pissamai Wilaisak, Piathip Kumwong, Thitima Sangkapitak, Nantada Ngaokrajang as actresses. A few sequences can be seen in both movies such as fruit throwing on Sombat's head, Sombat as a teacher to a stubborn student, Sombat looking for Rung who has fled from home. A nice old Renault 1960 is driven by Sombat. Some sequences only happen in 1961 version such as a romantic sequence in a cave, Sombat doing unsuccessful iron clothing and cooking food. The 1961 version still has a quite colorful image. 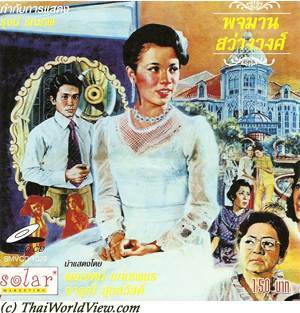 Thai movie สั่งอินทรีย์ขาวถล่มกรุง was released in year 1958. It features Surasit Sattayawong as main actor. The movie is lost in Thailand but a sequence of 22 minutes is left to be seen. The movie was earlier called อินทรีย์ขาว and then renamed before the launch as สั่งอินทรีย์ขาวถล่มกรุง. But name อินทรีย์ขาว still appears in the title credits! For the screenings in Bangkok, Surasit and the team of actors did the dubbing by themselves! It was the first movie as producer for Surasit Sattayawong. Surasit was also the director of this movie. Other actors include Sarinthip Siriwan, Namgneun Boonnak, ชาลี อินทรวิจิตร, จรูญ สินธุเศรษฐ์, เสน่ห์ โกมารชุน, จันทรา เมธากุล, Sukon Koewliam, ทานฑัต วิภาตะโยธิน, ทองแป๊ะ สินจารุ. Surasit is working in a outdoor mine. A woman claiming to love Surasit also has a love affair with the mine's owner. Surasit discovers the truth. Surprising both together, he shoots his wife and the lover. Later on, a big brawl happens in a village. Surasit is now a rickshaw driver. A big street fighting erupts between two groups. After the fighting, a discussion happens in a room. While carrying rice, Surasit has arguments with others workers who makes fun of him. Another general brawl happens. There is a sequence where a child is talking to a fat guy. It looks like it is Settha Sirachaya (เศรษฐา ศิระฉายา) when he was 14 years old. The hotel bar caretaker Noi is a brave guy (Prachuap Ruekyamdee) but he is a bit gullible and too nice to customers. The hotel is used as rehearsal hall by choral or a Philippine artist such as miss Flora or Chinese opera (งิ้ว) or even a boxing match. The hotel is often used for arm wrestling competition. The caretaker Noi can often beat men much stronger than him. This strange hotel has only one room and it is already occupied by Mr Chana (Chana Sriubon). Issue arises when a young lady called Riem (Sarinthip Siriwan) asks for a room also. Chana renames the hotel Paradise as hotel Hell (โรงแรมนรก) as it is too noisy. Chana and Riem keep arguing for the room and even fight for pillows (ใจดำ). Chana is getting mad as he cannot sleep properly. Rumors about bandit Seua Din reach the hotel. Taking a bath in a nearby river, Riem needs to borrow Chana's gun to protect herself in case Seua Din is around. As Chana refuses, she bets with him and wins a shooting game. Three ruffians including a fierce guy called Krai are looking for Chana as he is an accountant. They wish to rob his money before he pays company salaries. Noi's uncle is shot. Riem is back when they start to beat Noi and Chana to know when the money arrives. The ruffians are quite polite (เสือสุภาพบุรุษ) but determined to get the money. Noi tells that Riem is Chana's wife. To make Chana speaks, the ruffians threaten his wife’s integrity. Chana finally accepts to tell that money will arrive at 4am. Love emerges between Riem and Chana. One of the ruffians helps Noi as he was looking for honest job and not a thief job. Krai shoots his two friends at nighttime as he believes they betrayed him by protecting Chana. Seua Din enters in the hotel and wishes to get the money also with no sharing. So a Russian roulette game is organised between Krai and Seua Din. Seua Din is very polite (เสือสุภาพบุรุษ) also but not Krai who breaks the game rules and shoots him. Chana and Noi capture Krai. The agent sending the money was Riem, daughter of the company owner. Chana and Riem cannot marry as Chana believes he is a small accountant only. Riem succeeds to convince him. There is a great performance of Prachuap Ruekyamdee who is playing a major role here instead of being a second role in a movie with leading actor Mitr Chaibancha. The movie scenario is very witty. Country Hotel (โรงแรมนรก) is a 1957 black and white movie lasting 2h19mn. It was filmed in 35mm format (using real actors voice) at the opposite of mainstream Thai movies using 16mm format (using dubbers). The movie received 3 awards in 1959 (best director, best image, best sound). The bar can still be found at Thai Film Archives museum. Western classical music is used. There is a great soundtrack used to create special ambience when fighting is happening. It is an indoor movie shooting. 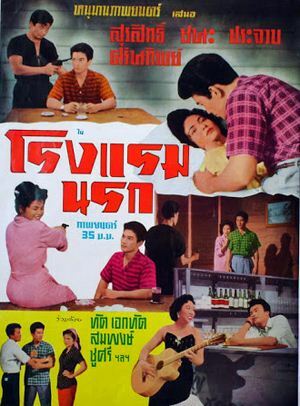 Thai movie เศรษฐีอนาถา was released in year 1956. Some Thai actors and actresses featured in this movie are Dokdin Kanyaman, Sarinthip Siriwan, เจิม ปั้นอำไพ, ระเบียบ อาชนโยธิน, เสถียร ธรรมเจริญ, Prapan Narkthong. Actor เจิม ปั้นอำไพ got a Thai cinema award for his performance in this movie as second role. The movie was never released in Thailand under VHS, VCD, DVD format. It is still available under a dubbed version in Thai Film Archive. It lasts 117 minutes. It is very colorful. In year 2018, it was shown in Thai theater “The Scala” in Bangkok to commemorate the 50 greatest Thai movies during Thai King Rama IX era. A sequence lasting 30 seconds is available online. It shows a father having bought a lottery ticket and winning the grand price, wedding of his daughter, the father being a drunkard.